Tonight sees a headline back-to-back set and accompanying line-up as Omid 16B launches a series of worldwide events under the Alola Presents banner - the name of the deep house label he launched 20 years ago. 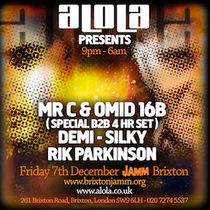 Omid 16B will be playing a never seen before, four hour back-to-back set with his friend and stalwart of the scene, Mr. C.
Joining them will be Omid's long term SOS partner, Demi, who like Omid 16B and Mr C, continues to play week in week out all over the globe. The party warm-up comes from London-based Silky alongside Rik Parkinson. This launch showcases some of the finest electronic music, a show presented by those who have a passion for the scene in a setting and style that is searching for new angles in order to entertain those who love this music. For more info, check HERE. Download their latest DJ Mixes below.